Despite the disparity in numbers, the market for Chinese and Japanese works of art are increasingly aligned. Five years ago it was common to hear simplistic contrasts between the markets for Chinese and Japanese works of art. The former continued to fire on most cylinders. Only occasionally would the latter, challenged by economics and a fall from the collecting zeitgeist, splutter into life. Today, although the numbers of buyers and the sums of money remain quite different, the two markets are much closer aligned. Less than a decade since the crazy ‘adolescent’ days of 2010-11, the market for Chinese works of art appears close to maturity. Selectivity has become rule number one. Energy and excitement still exist. Two single-owner collections sold during November generated it in spades: that of Roger Soame Jenyns (1904-76), which excelled across two sales at Christie’s, and the eight contemporary Chinese paintings acquired c.1990 by Body Shop founder Dame Anita Roddick (1942-2007) sold by Woolley & Wallis during a full 45 minutes of bidding on November 13. It was proof once more of the allure of attractively priced, market-fresh goods that chime with ‘Chinese taste’. And, when viewed across those five years, it showed that taste – once stereotyped by Qing magnificence – is undoubtedly evolving. Interest in areas as diverse as classic-age ceramics, Buddhist sculpture and artist-decorated porcelain from the Republican and People’s Republic eras was evident across the panoply of auctions that contributed to this year’s Asian Art in London jamboree. But with selling rates often uncomfortably close to 50% there is no doubt that buyers – spoilt for choice, wary of fakes and content to pass on anything deemed over-priced – are increasingly picky. All auctioneers endured difficult moments on the rostrum. A renowned British art historian, collector and connoisseur, Soame Jenyns was assistant keeper of Oriental antiquities at the British Museum from 1931-67 and wrote several definitive books on Chinese and Japanese ceramics. 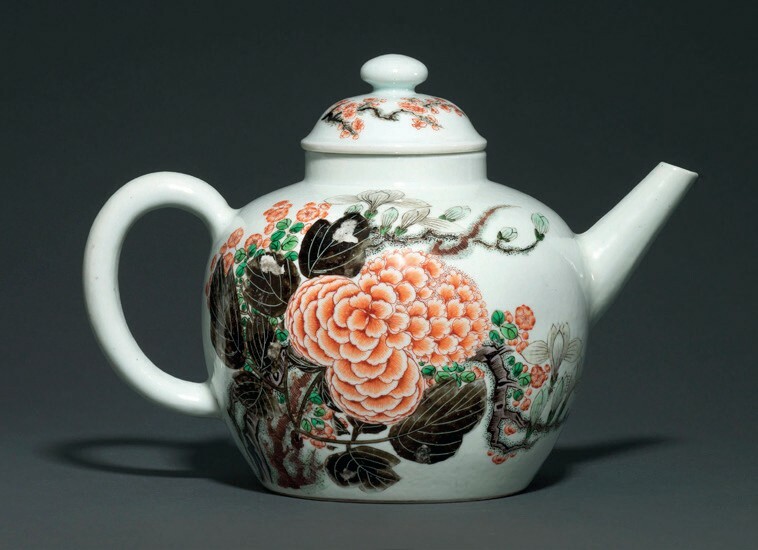 A Yongzheng famille verte teapot carrying the inscription 'yu tang chun fu gui' from the collection of Roger Soame Jenyns, £400,000 at Christie’s on November 6. Christie’s (25/20/12% buyer’s premium) included 24 pieces from his collection in its November 6 King Street sale and 138 lots in a dedicated online catalogue ending on November 8 – all from the estate of his son who died earlier this year. 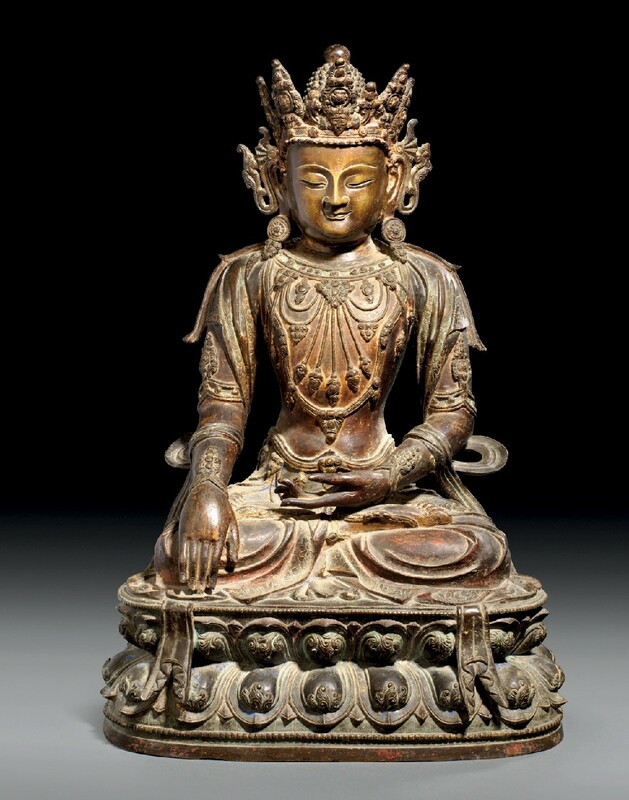 A 10in (25cm) early 15th century gilt bronze seated figure of Avalokiteshvara (Guanyin) was one of several lots to far exceed estimate, selling for at £1.6m (estimate £150,000-200,000) on November 6. As reported in ATG No 2367, it included the inscription ‘Bestowed [during the] Xuande era [of the] Great Ming’ and retained its dedicatory materials held in place by a copper base plate. Estimated at £20,000-40,000 but sold at £400,000 was a large teapot made in the early years of the reign of the emperor Yongzheng (1723-35). Decorated in famille verte enamels, with the bold use of black and overglaze iron-red, it combines the inscription yu tang chun fu gui (may your noble house be blessed with riches and honour) together with blooms of magnolia, peony and crab-apple that together create a rebus for this auspicious phrase. To the base is a six-character Yongzheng mark. The inscription ends with the enigmatic signature Yue Qing (literally ‘moon’ or ‘month’ and ‘minister’ or ‘high official’) followed by a seal mark yun ju (‘cloud dwelling’). Both may relate to a Buddhist monastery. A similar 10½in (27cm) vessel in the collection of the Palace Museum Beijing does not have a reign mark. The innovative and often technically perfect ceramics of the Yongzheng period continue to set the collecting benchmark. 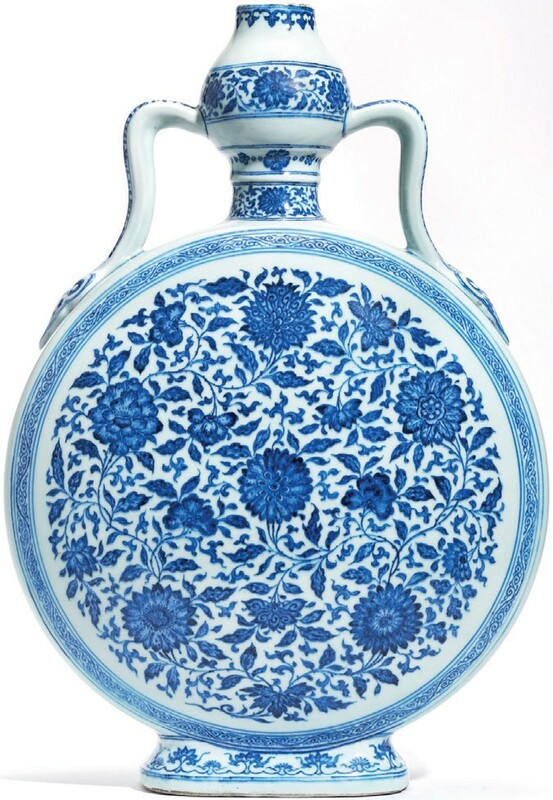 From another vendor was a large Yongzheng mark and period moon flask or bianhu. Christie’s consultant Rosemary Scott penned a long catalogue note praising its exceptional size at 21in (53 cm) high, its distinctive form and the early 15th century Ming style decoration that reflects the emperor’s keen antiquarianism. The famous director of the imperial kilns, Tang Ying (1682-1756), who first came to Jingdezhen as resident assistant in 1728 and stayed until well into the Qianlong reign, was especially celebrated for his success in imitating Yongle and Xuande wares. A passage in the 1795 history Jingdezhen Tao-lu by Lan Pu noted that ‘his close copies of famous wares of the past were without exception worthy partners [of the originals]’. Consigned from ‘a distinguished European private collection’ with an estimate of £1.2m-1.5m, the vendor’s grandfather acquired it in Asia between 1920-43. It sold at the lower end of expectations at £1.2m. In all 182 of 320 lots (57%) were sold at this King Street sale for a gross total of £8.7m. Sotheby’s (25/20/12% buyer’s premium) sale of Important Chinese Art the following day included two well-provenanced Qianlong (1735-95) period spinach-green jades. Once in the collection of Robert Napier, First Baron Napier of Magdala (1810-90), they were among the 3080 works exhibited at The Royal Academy’s 1935 International Exhibition of Chinese Art. Jades of this quality, size and colour only became possible during the 1760s after the Qing army exerted control over the mines and rivers in the Khotan region. Although collecting taste has moved to lighter coloured carvings, these darker hardstones were much admired by the Qianlong emperor, who often chose raw jades with imperfections and blemishes because he believed they could better represent the colours of nature. 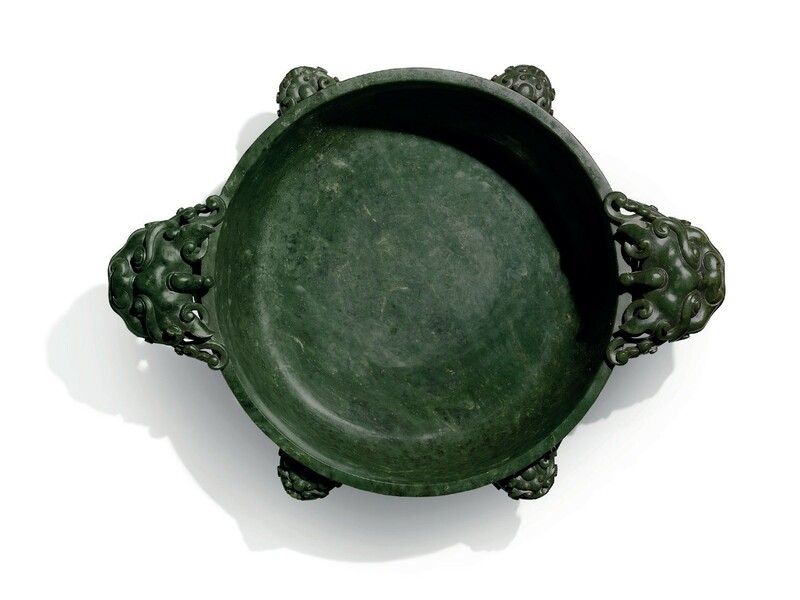 A Qianlong spinach-green jade marriage bowl, exhibited at The Royal Academy’s 1935 'International Exhibition of Chinese Art', £600,000 at Sotheby’s on November 7. A washer or marriage bowl carved with a total of six beast-head handles and freely moving rings measured a huge 20in (50cm) across. According to palace documents of the period, jade washers with freely-moving rings typically came with two, four, or six rings – the latter the most challenging to carve in an era when jade was cut by hand on an iron mill. French author and jade collector Stanley Charles Nott references this specific piece in his 1936 book Chinese Jade Throughout the Ages. Estimated at £600,000- 800,000, it was bid to the lower guide. From the same source was a 7in (17cm) imperial spinach jade cylindrical brush pot or bitong meticulously carved in various levels of relief with a gathering scene of five sages in a scenic mountainous landscape. The subject is the Elders of Juyang: five ministers of the Northern Song court who, after retiring from office, lived reclusively in Juyang where they would meet to compose poetry. Both the peaches they hold and the choice of three large auspicious trees symbolise longevity. Estimated at £300,000- 500,000, it sold at £580,000. By way of comparison, a spinach jade brush pot of the same size and subject sold for €751,500 at Sotheby’s Paris in June 2017. It was part of a collection of Qing jades formed in the 1960s and unseen on the market since. This latest Sotheby’s sale was led by a fine 6ft 8in (2.04m) corner leg table fashioned in huanghuali and nanmu. Dated to the 17th or 18th century, long tables such as this made without stretchers (tiaozhuo) were used in the scholar’s studio for the creation and admiration of scroll paintings. It was much admired for its minimalist form. The result, however, was unexpected. Purchased from Hong Kong dealer Chan Shing Kee in 1982 and offered as ‘the property of a gentleman’, it was estimated at £60,000-80,000 but sold at £2.4m. In total 85 (59%) of 145 lots were sold for a total of £9.2m with a further 188 (71%) of 267 lots sold for £1.36m during a George Street sale on November 9. 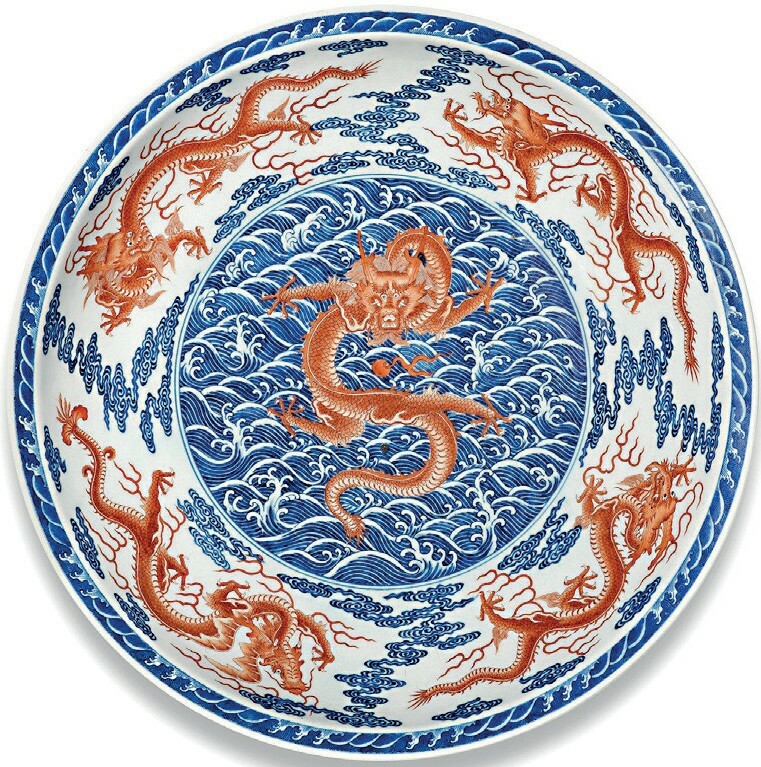 Bonhams’ (25/20/12% buyer’s premium) mixed-owner sale titled Fine Chinese Art on November 8 was topped at £440,000 by a large imperial Qianlong mark and period underglaze-blue and iron-red enamel ‘nine dragon’ dish. This particular design, inspired by early Ming ceramics, was championed in the Yongzheng period, but this example, measuring close to 19in (48cm) across, is one of only a handful of dishes of this type with Qianlong marks. Records from the imperial household note the presentation of a dish of this description (a ‘large Xuande-kiln dish with red dragons among blue clouds and waves’) to the emperor on the 25th day in the sixth month of the third year of the Qianlong period, corresponding to 1738. This dish was purchased by the British businessman and Hong Kong politician Sir David Newbigging in China in 1960 and brought to the UK in 1984. A Qianlong mark and period underglaze-blue and iron-red enamel ‘nine dragon’ dish, £440,000 at Bonhams on November 8. An imperial jifu from the Qianlong period came for sale from the family of Brigadier-General Offley Bohun Stovin Fairless Shore (1863-1922) who had acquired it during a visit to Beijing in March 1912. His wife’s letter of September 24, 1913, describes them attending a fancy dress ball in which “Offley wore the beautiful Chinese coat of blue and gold and silver that we bought in Peking”. 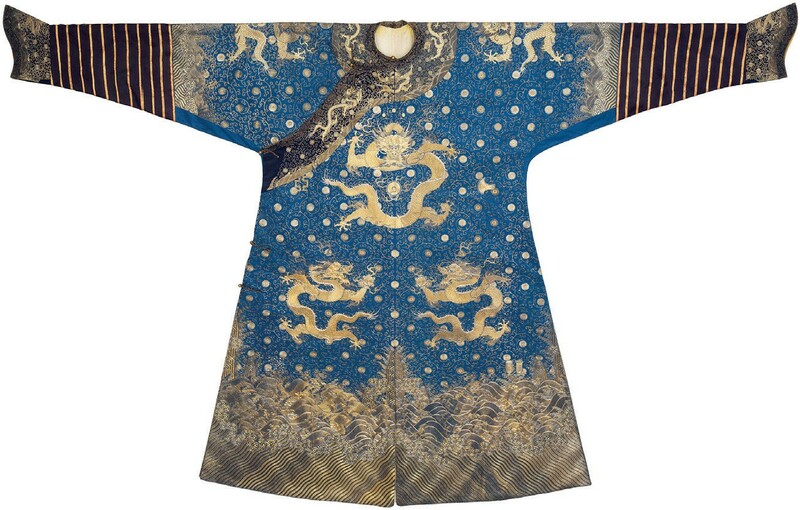 Midnight blue-ground robes – here embroidered with nine five-clawed dragons and the 12 symbols of imperial authority – were worn by the emperor only twice a year during ceremonies aimed at invoking rain and good harvest at the Temple of Heaven. All imperial paraphernalia used at this location shared the same colour. A similar robe was sold at Christie’s New York in March 2004 for a premium-inclusive $192,300. This example took £380,000 (estimate £100,000-150,000). Four of the other lots in the top ten were Ming and Qing rhinoceros horn carvings (the last the auctioneer’s will sell – see News Digest) bringing the total to £3.9m with a solid 145 (78%) of 193 lots sold. 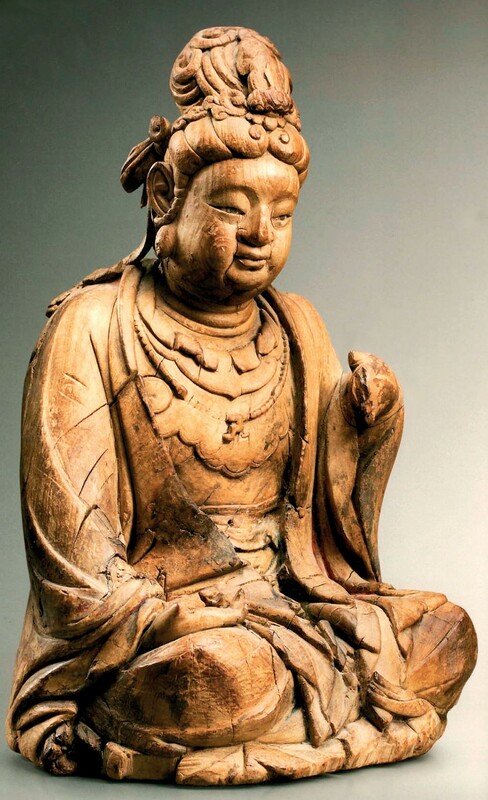 At £420,000 (estimate £120,000- 150,000), a pair of carved wood seated figures of Avalokiteshvara from the Southern Song (1127–1279) period was the top seller of Bonhams’ sale titled The Ollivier Collection of Early Chinese Art: A Journey Through Time. Seventeen of the 35 lots were sold totalling £1.9m. The French businessman and philanthropist, Jean-Yves Ollivier, began his collecting odyssey after visiting the National Palace Museum in Taipei in the late 1960s. These finely carved 17in (44cm) high figures, that would have stood either side of an altar, were last sold in 1995 at Christie’s London as part of a collection from Rome. Olliver had bought a large Tang (618–907) sancai-glazed statue of a braying Bactrian camel from a dealer in Hong Kong in 1991. At the time they were among the most highly prized of all Chinese works of art, evocative of the era when the Tang capital, Chang’an – one of the largest and most cosmopolitan cities in the 9th century world – thronged with caravans from the Silk Road. Today, as ‘inauspicious’ burial goods, Tang figures remain primarily ‘western taste’ and appear relatively good value. 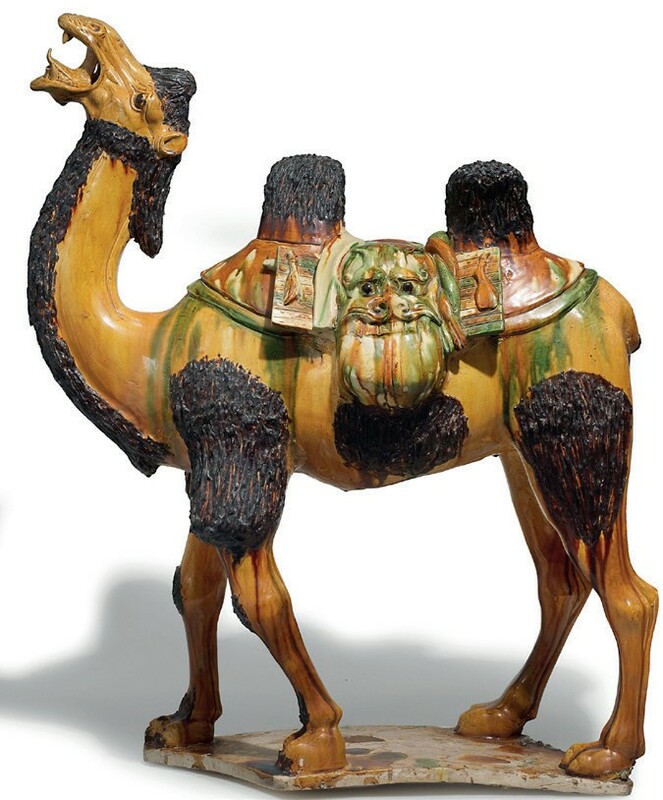 This fine model, standing 2ft 8in (82cm) high and made for a high-status individual – perhaps a merchant or an officer of the imperial camel herds – sold at the lower estimate of £300,000. With the sale of The Northern Girl by Yang Fei Yun (b.1954), the seven-figure barrier has now been passed on 10 occasions at the Salisbury salerooms of Woolley & Wallis (25/12% buyer’s premium). The artist’s wife Peng Peng, pictured in the portrait wearing traditional red dress in the early years of their marriage, was in the room to see the picture sell to one of four serious bidders at £1.7m. It pushed the overall take across two Chinese art sales at W&W to £4.8m. 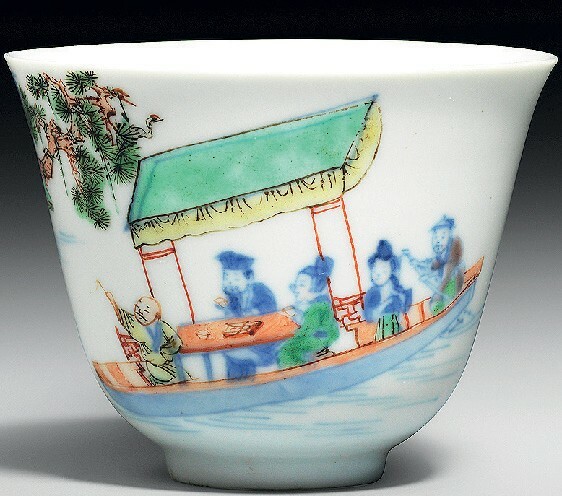 Results in other areas were typically more mixed, but a strong £160,000 was taken for a Kangxi (1662-1722) mark and period famille verse wucai ‘poem’ cup. Painted with a scene from a famous poem Chibi fu (Ode to the Red Cliff) by Su Shi (1037-1101), it depicts the Song poet and his friends visiting the famous naval battle site at Chibi with the reverse reading I raised my wine cup and toasted my guests, joining them in chanting the Ode to the Bright Moon and the Song of Sylphs. A seal reads Elegance. This 2in (5cm) cup has a provenance to both John Sparks and then to Sydney Moss from where it was bought by an English private collector in 1963 for £60. The estimate was £30,000-50,000. Sold at £100,000 (estimate £50,000-80,000) was a large 22in (54cm) Xuande (1426-35) bronze of Buddha Shakyamuni seated in dhyanasana. Many such images were made during the reign of Xuande (1426-35) – a time when the imperial court looked favourably upon Buddhism and made a concerted effort to build secular and religious alliances with Tibet. A quartet of Asian art sales had been held the previous day (November 12) at Duke’s of Dorchester, Chiswick Auctions, Dreweatts in Newbury and Roseberys London. All had their moments even if overall sale-through was not stellar. The sale of Fine Chinese Paintings at Chiswick Auctions (25% buyer’s premium) included a calli-graphic work by the emperor Qianlong himself. Estimated to fetch £6000-8000, it took £56,000. Ink and paper scroll from the hand of the Qianlong emperor himself, £56,000 at Chiswick Auctions on November 12. Born Hongli, the fourth son of the emperor Yongzheng, Qianlong was arguably the greatest art collector and patron in 5000 years of Chinese history. His collection spanned Chinese, European, Japanese and Indian works of art and he was a prolific poet and calligrapher. This ink on paper hanging scroll of running script, measuring 5ft 2in x 21in (1.58m x 53cm), copies a poem by Wei Zhuang (836-910) which was included in the literary encyclopaedia Siku Quanshu (The Complete Library in Four Branches of Literature) commissioned by the Qianlong Emperor in 1772. It is signed Yu Bi or From the Brush of His Majesty. Paintings of traditional Korean life starred in a sale of Asian art at Roseberys (25% buyer’s premium). The set of 16 paintings on silk were catalogued as ‘Korean School’ but created by Kim Jun Keun, better known by his artistic name Kisan. 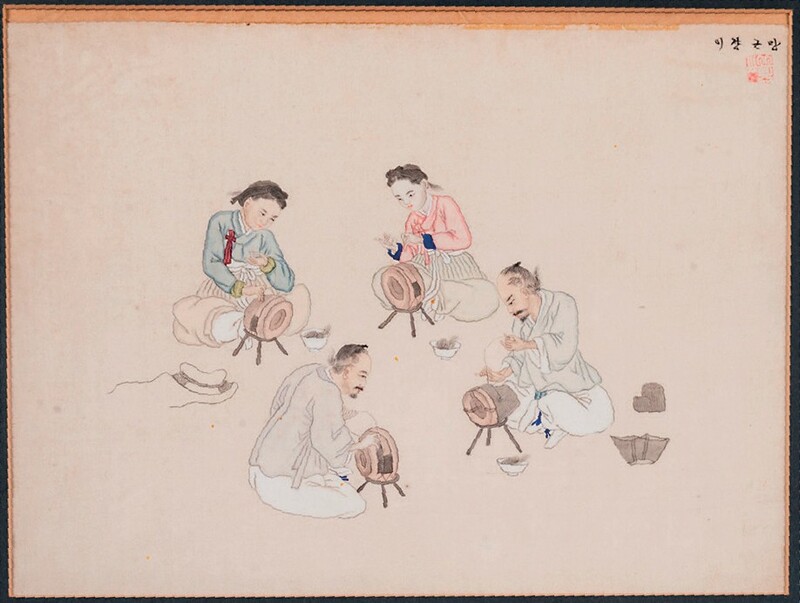 Genre scenes of Korean rites, crafts and customs – already disappearing by the time pictures such as this were sold to 19th century travellers in port cities – were his stock in trade. Two bidders using thesaleroom.com took the lot to £40,000 – over 26 times the guide. One of a set of Korean genre paintings on silk by Kisan, £40,000 at Roseberys on November 12. Sharing this sale-topping bid was a pair of Yongzheng mark and period lemon yellow bowls – a glaze colour which was conceived during Yongzheng’s reign by combining antimoniate of iron was combined with tin. The bowls, from a titled gentleman, had ‘sold’ for £65,000 in May but the bill had gone unpaid. Among the most eagerly contested lots at Roseberys was a group of finely carved Ming and Qing cinnabar lacquer boxes from a private London collection. A 3in (7.5cm) lotus form box and cover from the early 15th century was sold at £21,000 (estimate £6000-8000) while an 18th century 7in (17.5cm) hexalobed box and cover, with a Spink paper label to the base, tipped over estimate to bring £18,000. It was worked with a cartouche of two scholars engaged in a game of wei qi and to the sides with the bajixiang (eight Buddhist emblems). 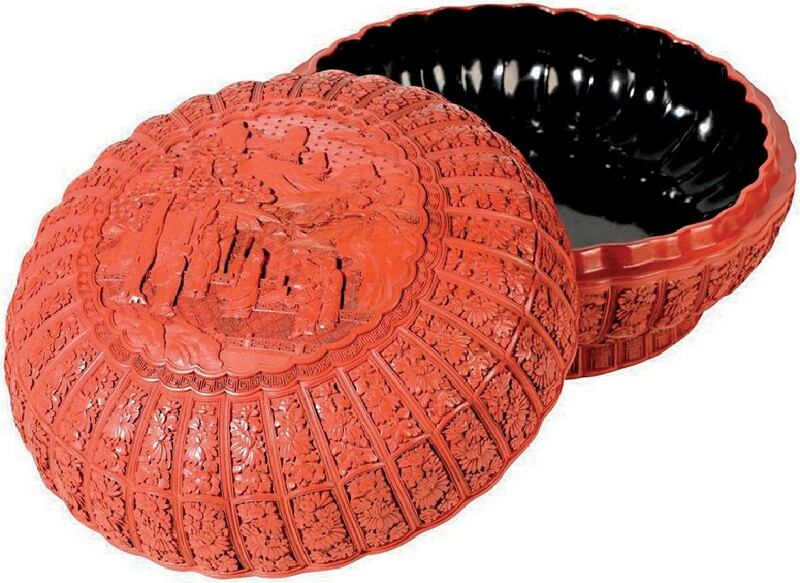 Qianlong cinnabar lacquer chrysanthemum box, £15,000 at Duke’s on November 12. A Qianlong cinnabar lacquer chrysanthemum-form box and cover sold for £15,000 at Duke’s (22% buyer’s premium). Measuring just over 8in (21cm) across, it was finely carved with a central scene of scholars, rocky mountains and pines with the lobed sides with radiating panels of chrysanthemums. It had an old US customs label to the underside and, according to family history, was acquired in the States by a Belgium private collector c.1930. The sale featured two West Country private collections: property from the family of Cape Town artist Albert Newall (1920-89), much of it in attic storage in Dorset for a generation, and a group of more than 60 bronze bodhisattva. The latter included a 16in (40cm) high Sino- Tibetan figure seated on a double lotus base catalogued as 19th century but deemed earlier. Estimated at £2000-3000, it took £35,000. Qing bamboo root carving, £35,000 at Halls of Shewsbury on November 28. 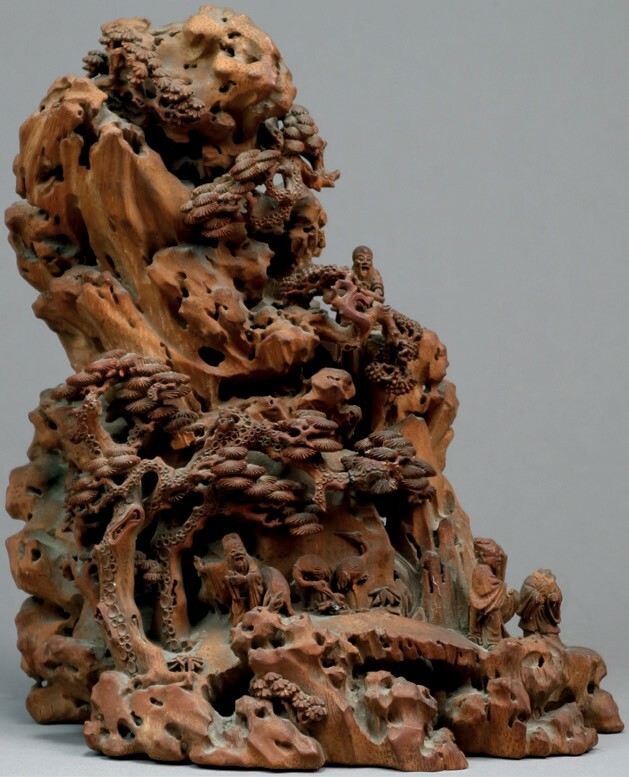 Another typical Qing period scholar’s object – a 9in (23cm) bamboo root carving worked as a rocky outcrop populated sages amid gnarled pines – took an unexpected £35,000 after a bidding battle between multiple phones and online at Halls (20% buyer’s premium) of Shrewsbury on November 28. With some small losses to figures and tree branches, it had been estimated at £400-600. Underlining the changing nature of the market for Chinese works of art, it was a piece of porcelain from the early years of the People’s Republic that led Sworders’ (23% buyer’s premium) Asian Art sale in Stansted Mountfitchet on November 6. The winning bid for a Communist era dish decorated by Tu Juqing in the famille rose palette with an idealised scene of girls dutifully repairing fishing nets was an unexpected £28,000. The rising prices of the best 20th century Chinese porcelain – once shunned as simply decorative wares by Western collectors – have been mirrored by a growing interest among younger Chinese collectors in their Buddhist heritage. Estimated at £7000-10,000 but sold at £22,000 was a diminutive 16th century Sino-Tibetan bronze bodhisattva under 4in (9.5cm) high. 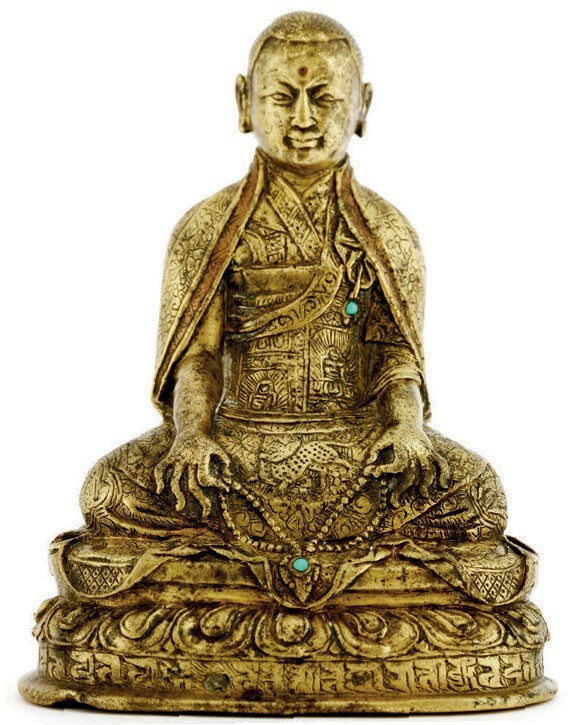 A Sino-Tibetan bronze associated with the Jonang school of Buddhism, £22,000 at Sworders on November 6. Finely engraved with lines of Sanskrit and panels of flora and fauna and inlaid with turquoise beads, it is part of a small number of surviving bronzes associated with the Jonang school of Tibetan Buddhism. The school was widely thought to have become extinct after persecution in the late 17th century. However, several monasteries survived in secret and Tibetologists were recently astonished when fieldwork turned up several active Jonangpa monasteries populated by close to 5000 monks. 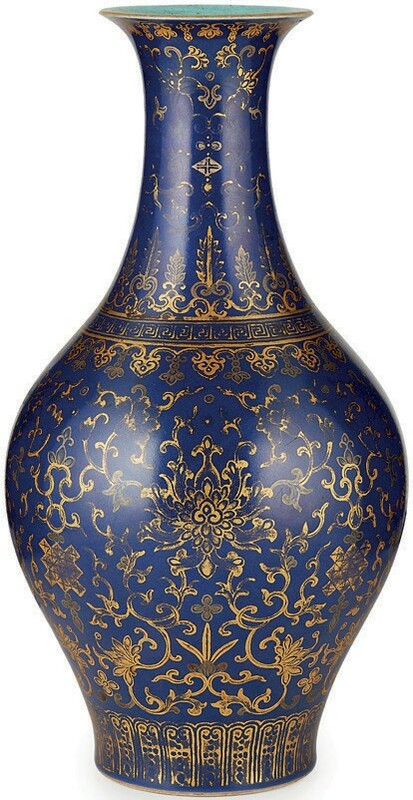 A Jiaqing gilt decorated blue-ground vase, £70,000 at Lyon & Turnbull on November 7. Leading the sale held by Lyon & Turnbull (25% buyer’s premium) in London on November 7 was a 13in (33cm) royal blue ground vase with gilt lotus decoration – characteristic of the Jiaqing (1796-1820) period and here with an iron red six-character mark. As Buddhist texts were written in gold on blue paper, the two colours (an effect appearing for the first time in the Jiaqing period) have a special significance. It came for sale from a private Edinburgh collection with an estimate of £2000-3000 but attracted bidding up to £70,000. 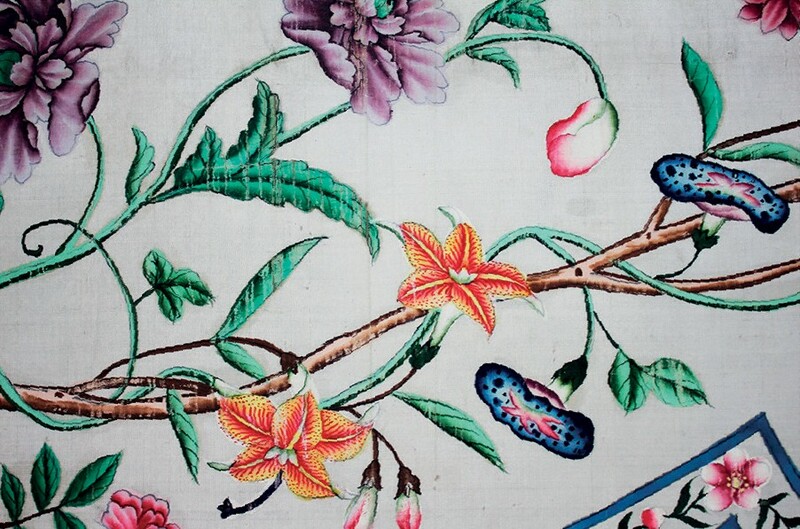 A detail of a Chinese export painted silk panel, £1100 at Trevanion & Dean on November 17. Sinomania – the fashion for all things Chinese – is by no means a new phenomenon. Intact and unused since the late 1700s, elements of a painted silk bed hanging sold to an institutional buyer for £1100 at Trevanion & Dean (20% buyer’s premium) in Whitchurch on November 17. Decorated with sprays of peonies, tulips and other flowers, the six sections – the largest 5ft x 2ft 4in (1.54m x 70cm) – had suffered cracking, cutting and fraying through mounting but had scarcely faded. Cataloguer Rebecca Gilman speculated they may have been shelved as chinoiserie, popular for a century, was becoming passe towards the end of the 1700s. “From our perspective it is quite wonderful [they] were never used,” she said. “The colours are still so bright and so vibrant, exactly as they were intended to be seen over 200 years ago.” After a bidding battle with a London-based collector, the silks were secured by ‘a national institution’. 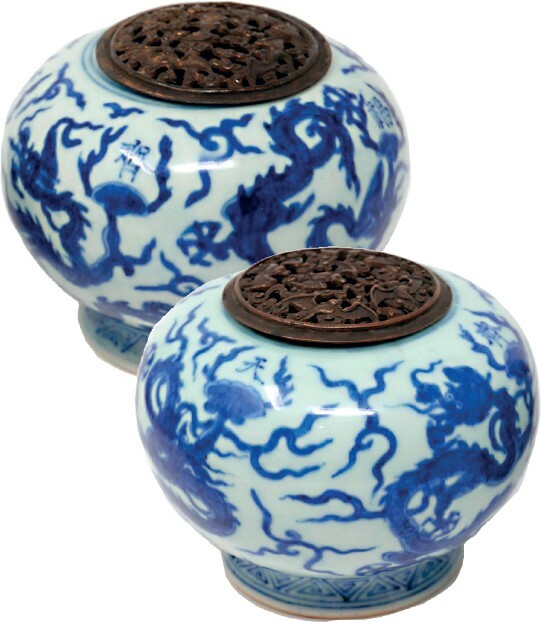 A pair of Qing blue and white incense burners, £25,000 at Criterion on November 5. Criterion (24% buyer’s premium) in Islington, north London, held its first designated Asian art sale on November 5. An old (early 20th century) private collection of Chinese porcelain from a deceased estate provided the core of the sale and the top-selling lot – a pair of Qing blue and white porcelain incense burners. Decorated with five claw dragons chasing flaming pearls and with apocryphal six-character Ming marks to the base, they retained bronze lids pierced decorated with bats. Pitched at £300-500, they took £25,000. A late Ming pale green jade bodhisattva, £15,500 at Mallams on October 31. The Asian art sale at Mallams Cheltenham (20% buyer’s premium) on October 31 was topped at £15,500 (estimate £2000-3000) by a late Ming pale green jade of a seated bodhisattva. The 8½in (21cm) high figure, wearing a Tibetan style tiara crown and a ruyi pendant necklace, had been among the favourite possessions of its former owner, the late British stage and film actor Peter O’Toole (1932-2013).